Transcatheter embolization is a process of placing synthetic material or medication called embolic agent into blood vessels through a catheter to block blood flow toward a specific area of the body. Embolization is a highly effective way to prevent abnormal bleeding and is minimally invasive as compared to open surgery. Additionally, the technology is proving its efficiency in treatment while performing complex surgeries. The global transcatheter embolization and occlusion devices market was valued at US$ 2.7 Bn in 2017 and is anticipated to expand at a CAGR of 7.9% from 2018 to 2026. The embolization coils segment dominated the global market in 2017. Rise in prevalence of chronic diseases, technological advancements, increase in patient awareness and health care expenditure, and surge in need of treatment of complex diseases drive the global market. The embolization particles segment is expected to expand at the highest CAGR during the forecast period. The segment has witnessed strong growth owing to increase in demand for drug-eluting particles and radioembolization particles. The highly fragmented nature of the global transcatheter embolization and occlusion devices market has prompted market players to shift focus toward relatively niche segments such as liquid embolics. The global transcatheter embolization and occlusion devices market has been segmented based on product, application, end-user, and region. In terms of product, the global market has been classified into embolization coils, coiling-assist devices, embolization particles, flow diverter devices, liquid embolics, and accessories. The embolization coils segment has been bifurcated into pushable coils and detachable coils. The coiling-assist devices segment has been segregated into stent-assisted coiling and balloon-assisted coiling. The embolization particles segment has been categorized into radioembolization particles, microspheres, drug-eluting beads, and others. The accessories segment has been divided into catheters, guide wires, and others. Based on application, the global transcatheter embolization and occlusion devices market has been classified into peripheral vascular disease, neurology, oncology, urology, and others. The peripheral vascular disease segment is projected to hold major share of the global market due to increase in incidence of targeted diseases across various regions, rise in prevalence of lifestyle diseases, and ongoing technological advancements. In terms of end-user, the global market has been divided into hospitals, ambulatory surgical centers, and clinics. Growth of the hospitals segment can be attributed to the increase in prevalence of various chronic diseases. In terms of region, North America dominated the global transcatheter embolization and occlusion devices market in 2017, owing to a highly developed health care sector, increase in awareness among health care providers about transcatheter embolization and occlusion devices, and continuous evolution of products. North America is also an attractive market in term of revenue. Rise in government initiatives & laws and increase in population drive the transcatheter embolization and occlusion devices market in the region. Technological advancements and increase in adoption of advanced transcatheter embolization and occlusion devices are expected to propel the transcatheter embolization and occlusion devices market in Asia Pacific, Latin America, and Middle East & Africa during the forecast period. Key players operating in the global transcatheter embolization and occlusion devices market include BTG plc, Boston Scientific Corporation, Medtronic plc, Penumbra, Inc., Cook Medical, Edwards Lifesciences Corporation, Merit Medical Systems, Johnson & Johnson Services, Inc., Pfizer, Inc., Stryker Corporation, Terumo Corporation, Sirtex Medical Limited, and Abbott Laboratories. The global transcatheter embolization and occlusion devices market is growing at a rapid pace due to increase in advancements in treating complex diseases. Transcatheter embolization and occlusion devices have wide range of applications in the medical field. The embolization particles segment is anticipated to expand at a high CAGR during the forecast period. Rise in demand for drug-eluting beads and radioembolization particles contribute to the growth of the embolization particles segment. Increase in incidence of chronic diseases drives demand for products that offer rapid and efficient healing. Hence, a majority of hospitals have shifted preference toward advanced products. This helps decrease the average length of stay in hospitals through early recovery from disease. This, in turn, helps reduce surgical costs. Therefore, rise in need and demand for advanced products that increase therapeutic outcome drives the global transcatheter embolization and occlusion devices market. The global transcatheter embolization and occlusion devices market has been analyzed based on product, application, end-user, and region. In terms of product, the market has been classified into embolization coils, coiling-assist devices, embolization particles, flow diverter devices, liquid embolics, and accessories. The embolization coils segment has been bifurcated into pushable and detachable. The coiling-assist devices segment has been segregated into stent-assisted coiling and balloon-assisted coiling. The embolization particles segment has been categorized into radioembolization particles, microspheres, drug-eluting beads, and others. The accessories segment has been divided into catheters, guide wires, and others. Based on application, the global transcatheter embolization and occlusion devices market has been classified into peripheral vascular disease, neurology, oncology, urology, and others. In terms of end-user, the market has been divided into hospitals, ambulatory surgical centers, and clinics. Each of the segments has been analyzed in detail in terms of market trends, recent developments, outlook, and opportunities. The report provides current and future market size for each segment and sub-segment for the period from 2018 to 2026, in terms of revenue in US$ Mn, considering 2016 and 2017 as the base years. The compound annual growth rate (% CAGR) for each market segment has been provided for the forecast period from 2018 to 2026 along with the estimations of market size. In terms of region, the global transcatheter embolization and occlusion devices market has been segmented into North America, Europe, Asia Pacific, Latin America, and Middle East & Africa. The regions have also been sub-segmented into major countries and sub-regions. The current and future market sizes in terms of revenue (US$ Mn) of these regional markets and their major countries/sub-regions have been provided in the report for the period from 2016 to 2026, with CAGR (%) for the period from 2018 to 2026. The study also offers a list of recommendations and highlights of the market for new companies willing to enter the market and for existing companies to increase market shares, which is likely to help in the decision-making process. 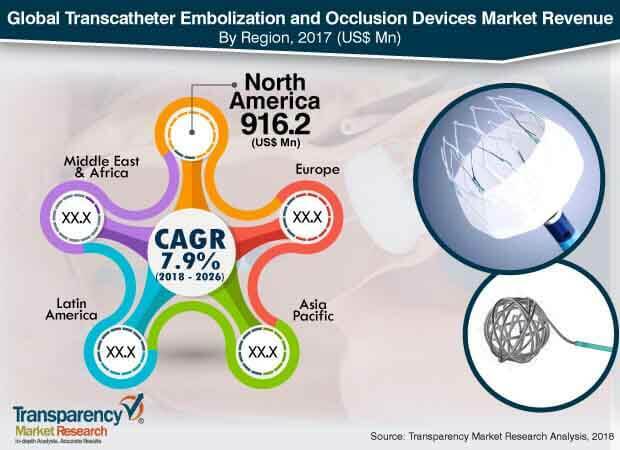 The overview section of the report provides the market dynamics and market trends such as drivers, restraints, opportunities, and key trends that influence the current and future status of the transcatheter embolization and occlusion devices market. The report also covers market attractiveness and market share analyses in order to provide a thorough analysis of the overall competitive scenario in the global transcatheter embolization and occlusion devices market. The report concludes with the company profiles section that includes information about the major players in the market. Key players profiled in the report include BTG plc, Boston Scientific Corporation, Medtronic plc, Penumbra, Inc., Cook Medical, Edwards Lifesciences Corporation, Merit Medical Systems, Johnson & Johnson Services, Inc., Pfizer, Inc., Stryker Corporation, Terumo Corporation, Sirtex Medical Limited, and Abbott Laboratories. Each of these players has been profiled in the report considering parameters such as company overview, financial overview, business strategies, product portfolio, and recent developments.